Featuring Mark Kline (FD) All rights reserved. http://www.thelivingtradition.org/ - A non-profit organization working for the preservation of traditional music and dance. Monthly concerts, all acoustic instrument jams, and contra dances. http://www.ctmsfolkmusic.org/ - California Traditional Music Society (CTMS). http://claremontfolkfestival.org/ - Claremont Folk Festival. http://folkmusic.caltech.edu/ - Caltech Folk Music Society. http://www.folkworks.org/ - Source for folk/traditional music, dance, storytelling & other related folk arts in the greater L.A. area. http://www.folkmusiccenter.com/ - Folk Music Center and Museum, Claremont, CA. http://www.ceolas.org/tunes/ - Tunes at Ceolas, which carries notation for several hundred traditional tunes, in various formats, along with music software and an index of most published tune sources and links to other sites with tunes and songs. http://www.kitchenmusician.net/ - Hammered Dulcimer, Living History, Scottish Fiddle & Traditional Music. http://www.freesheetmusic.net/oneills.html - Free sheet music - collection of O’Neill’s music of Ireland including 1850 tunes. Musical Instrument Repair - A. DZINA & SONS MUSIC, 2366-C N. Glassell St., Orange, CA 92865, (714)637-9665 - Their motto: “The Unrepairable We Rebuild” They repair dulcimers, accordions and many other instruments. Musical Instrument Repair - Morey’s Music, Inc., 4834 Woodruff Ave., Lakewood, CA 90713,562-420-9532 www.moreysmusic.com String replacement if customer provides strings. Sheet music. 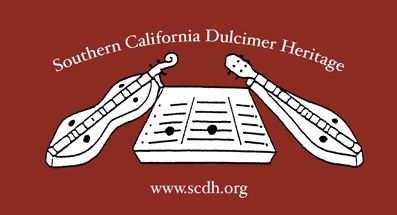 http://dpnews.com/ - Dulcimer Players News. The premier publication for all things dulcimer. http://www.dulcimersessions.com/ - Mel Bay Dulcimer Sessions bimonthly newsletter. http://dustystrings.com/ - Hammered & fretted dulcimers, harps, and more. http://www.banjomer.com/ - Doug Thomson’s Banjo-Mer. http://www.ukuleleparadise.com/ - Island Bazaar - For all things ukulele. http://billdempseymusic.com/ - fretted dulcimer, harmonica, banjo, guitar, vocals, etc.